July and August, with all their sunshine and warmth (but a relatively cool relief from most of the United States) hog the majority of visitors to Canada, but other times of the year, such as May, and spring in general, have much to offer, including cheaper rates, fewer crowds, and unusual activities. If you alter your expectations and arrive with a realistic attitude (and some waterproof clothing), you will get great value and enjoyment by visiting Canada in what can feel like a waning winter month of May. But where to go? You'll find appealing choices all across the country, from Newfoundland to British Columbia. 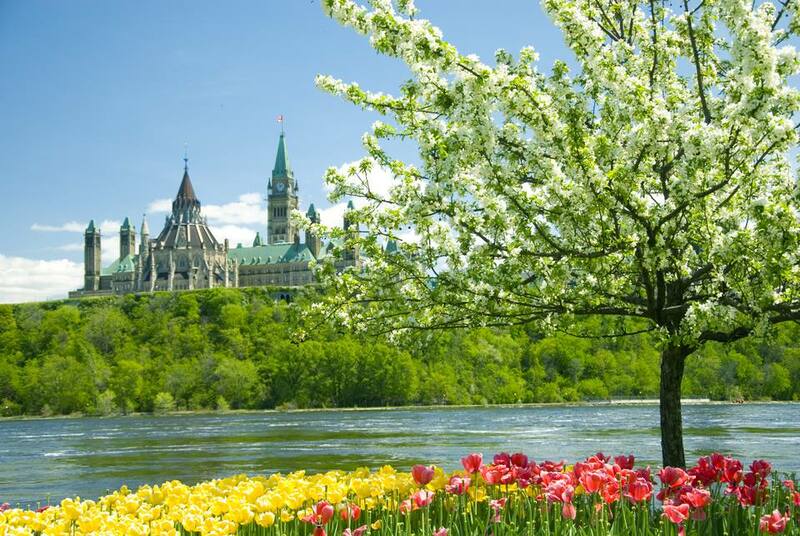 Since 1945, Ottawa has celebrated the blossoming of local tulips with a festival that has grown to the three-week, city-wide event it is today. The tradition began when Princess Juliana of the Netherlands presented Ottawa with 100,000 tulip bulbs in appreciation for the safe haven offered to exiled Dutch royalty and the role Canadian troops played in the liberation of the Netherlands during World War II. Not merely a botanical display, the Canadian Tulip Festival (its official moniker) includes live music, a vintage carnival and circus, and food stands. It's on from May 10 to 20, 2019. The Whistler-Blackcomb ski season is lusciously long. In May, when most every Canadian ski resort has had their end-of-season party, Blackcomb still has ski life left in it. (In 2018, Whistler closed on April 22.) The snow has had months to pile up, and the days are long in May. True, you may not be able to surf fresh powder, but you do get fewer crowds, major spring ski discounts, longer days for skiing, and, of course, the coveted goggle tan. In 2018, Blackcomb Mountain stayed open till May 21. Conditions in Victoria in May are just about perfect for exploring this modern city that is nevertheless full of history. The summer rush of tourists and summer temperatures have yet to arrive. In May, you will be greeted with dry, comfortable temperatures in the range of 59 F to 65 F. Flowers and greenery are in full bloom, and the sunshine is out for about 15 hours a day. Though July is when the throngs of cowboys and cowboy wannabes arrive in the city to partake in the Calgary Stampede, Calgary and the Canadian Rockies are peaceful and beautiful in May. Though a dump of snow is not out of the realm of possibility in May, it is unlikely, and the shoulder travel month means lower rates for flights and hotels. Calgary is not just the perfect gateway to Rocky Mountain highlights like Banff, Jasper, and the Icefields Parkway; it is also becoming a cultural hub with an increasing presence of museums, theater, and live music. Don't worry though, line dancing is still a well-practiced pastime and workout. Be sure to put a visit to Ranchmans on your itinerary for lessons. Spotting two of nature's gigantic aquatic beauties—whales and icebergs—together doesn't happen often, but Iceberg Alley—a stretch of the ocean along the coast of Newfoundland and Labrador—is where your chances are best. May and June are the optimum months to see both.